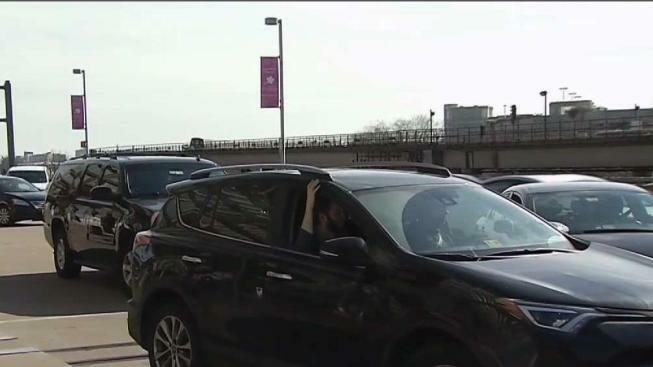 Shuttle buses are going to join Uber and Lyft drivers in picking up passengers in a drop-off zone at a terminal at Reagan National Airport beginning Monday. If you want to catch a shuttle bus after arriving at Terminal B/C at Ronald Reagan National Airport, you’ll have to head upstairs to the ticketing level. Shuttles to hotels, parking and rental cars are moving up to that level for pickups and drop-offs due to the expansion project at the airport. Lyft and Uber are already picking up and dropping off at that level. Taxis and private vehicles will continue picking up arrivals on the lower level. The change affects people flying Alaska, American, Delta, JetBlue, United and Virgin America. Some travelers are concerned about the traffic in the departures area. “Everything's broken as it is with picking up Uber and Lyft up here, so I don't know, you add more people, it's going to make a mess right here,” Kris Hagel said. Others are positive about the expansion project. “I do understand that there's going to be a lot of construction going on here for at least a couple of years, so I'm appreciative of whatever they can do to make our travel easy for us,” Lynn Rivers said. The expansion project is scheduled to be completed in 2021.